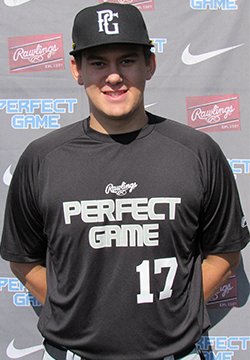 Christopher Goossens is a 2018 LHP/ with a 6-4 220 lb. frame from Hampden, MA who attends Minnechaug Reg. XL frame with strong lower half and overall very physical build. Primary lefthanded pitcher; online delivery with good tempo throughout, compact arm stroke through the back with quickness, tight release, works up to high three quarters arm slot and creates good angle downhill to the plate. Fastball worked 82-83 mph with varying life, showed the ability to sink it and to cut it depending on location. Threw strikes with fastball to both sides of the plate. Showed sharp curveball with 12/6 shape and good snap; good spin with depth and the ability to throw it for strikes. Also flashed changeup with straighter action and good deception out of the hand. Did a very good job working all three pitches and being around the strike zone. Very good student; verbally committed to Hartford. Named to 2017 Northeast Top Prospect Showcase Top Prospect List.